Stream anime episodes for free, you want to Watch Fairy Tail Episode 29 English Subbed online for free. Episode guide Fairy Tail Episode 29 English Subbed My Resolve The battle between Fairy Tail and Phantom Lord ends with Fairy Law while Natsu and Gajeel find they may have more in common than they realized. Lucy returns to the guild to apologize, and decides to return home to her father, much to the dismay of her friends, who follow her. 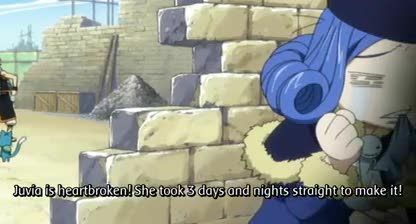 Dressed in fancy clothes and having endless servants as her disposal, Lucy stands up to her father and declares her home is with Fairy Tail and leaves him for good. Outside the gate, Lucy was greeted by Happy. Grey and Natsu claimed that the place is a very nice town but was corrected by Lucy who said that its her family estate. Erza was overwhelmed by the scenery while Grey and Natsu became awfully respected to Lucy (only lasted a while). They left together happily. 4.8 / 5 - 10 ratings.